Friends are a blessing and sometimes persistent in asking us to join in a certain project, adventure. They just don’t give up. Sometimes we wish they would stop “pestering.” Today’s readings remind us of persistence in prayer with God as Abraham bargains with God knowing God is mercy-filled. God answers our call for help (psalm 138). Paul calls us to rejoice in the abundant unconditional love of God, in spite of our own weaknesses or transgressions. In Luke’s gospel, Jesus reminds us that God will “give the Holy Spirit to those who ask.” Luke reminds us to keep knocking on the door until it opens. What does my heart seek and do I ask God? Do I express my needs (my poverty) to God and others, trusting I shall receive? Am I persistent in my own prayers? Have you ever planted a garden? If so, you know the toil required to initiate the soil for planting, the tedious work of seeing that the seeds or seedlings are placed in the ground to their best advantage, water just enough but not too much, the weeding and careful watch for aphids and other things that “bug” flowers and food. Then comes the praying that rain will come and sun will shine to nourish the tiny plants, but also hoping that there will not be too much of either rain or sun. A garden takes a lot of work. However, when the flowers bloom or the tomatoes ripen it calls for that grand feeling of self-satisfaction that indicates that you have participated with God in the creation of this beauty. The day was blisteringly hot with humidity at a high level. I appreciated the air-conditioning of my car, and was surprised by the blast of heat as I opened the door. I had parked in front of my workplace where cracks in the sidewalk were often found, but not dangerously wide to be hazardous. By my back tire, standing perkily at four inches was a tiny pink petunia. How it stood the heat was miracle enough, as there seemed to be nothing to nourish it. But there it was in the center of what was the most perilous part of the grounds. Why a car, my car, had not obliterated it was almost unbelievable. I stopped for a moment to marvel at it. It was a thing of beauty, certain to die soon. However there it was and remained for several days. Cars came and went; the sun was unbelievably hot: there was no rain at all. Yet the pink petals remained fresh and lovely, proud and perky, beautifully pink and totally without human connivance. The little petunia came because the good God had a task for it to perform. Several people saw the little flower, and stopped to admire it. Seldom would they do that for a bed of petunias! Looking at ONE and the situation it was in, brought them to attention. They marveled that it could thrive, and decided God had something to do with that. Have you ever looked at the person who is in the wrong place and seemingly useless and tried to discover what they offer? Contemplation has been a central part of our gatherings here in Oldenburg. To stop, be silent and let your thoughts be controlled by God. You realize many things you did not even know you knew! 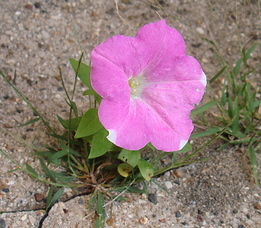 Sometimes we find a beautiful pink petunia where before there was only a crack in the concrete. The day was perfect as far as Ashley was concerned. Blue skies, a few white puffy clouds and sun shining brightly. She had put the top down on her convertible and just enjoyed the drive. Cars going the opposite direction whizzed past her. Traffic was very heavy, but she was being careful. So when a police officer stopped her she was confused. “Where do you think you are going?” the officer asked. What one-way-street are you traveling? Check closely. Is it the one you want? Choose the street that will get you to your goal. All those worrisome things that pound their way in to our thinking are going the opposite way. So we must learn to work around them. Sometimes it seems that the whole world is whizzing past us. The temptation is great to go with the flow. However, the less traveled road, the one that keeps bumping into things that swerve us from our final destiny, is the only one that will get us where we want to go – heaven. In the Gospel reading, Jesus treats both Martha and Mary lovingly and accepts each one’s gift as she has offered it. Martha’s gift is her hospitality. Mary’s gift is her presence and attention. 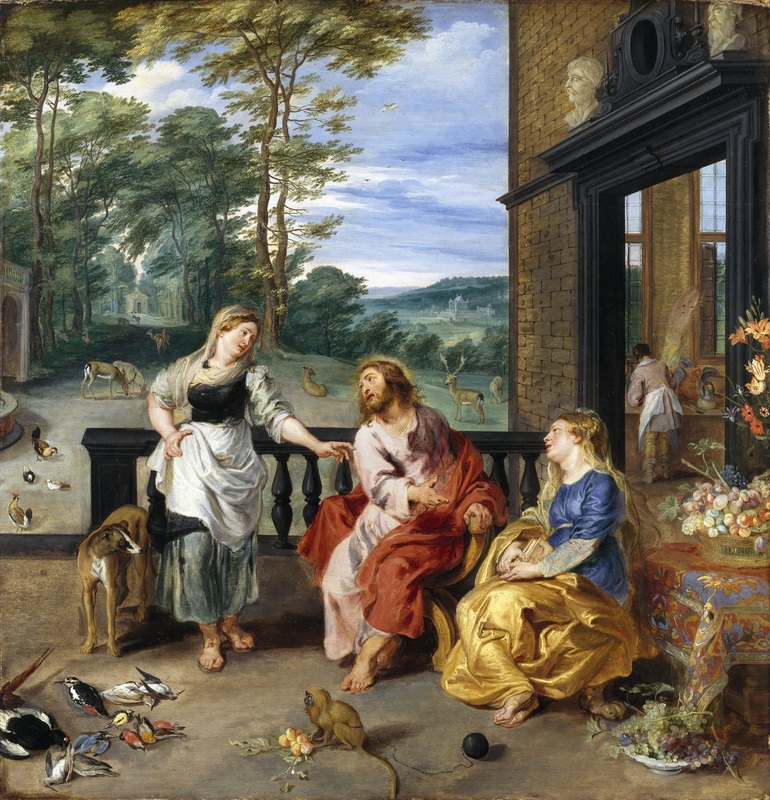 Jesus is not being ungrateful for Martha’s hard work. He is just pointing out that Martha’s serving seems to have become more important than her guest. Do I sometimes put my service to guests above the guests? In what ways do I sit at Jesus’ feet and listen to his word? God of loving kindness, help us to cultivate a personal relationship with Jesus and carry out lives of compassionate service to others. Move us to offer hospitality to strangers, especially the immigrant in our midst. We pray in Jesus’ name. Each of us most likely learned these Scriptures and God’s words to us and had them instilled in our hearts through our parents, family, teachers, and the faith communities with whom we have lived, worshipped, and prayed. It is our own fidelity to prayer and the community of faithful disciples of Jesus who continue to support us in deepening and living this call to love in our lives each day. Your words, Faithful God, are Spirit and Life. They refresh my soul and guide my life each day. They are trustworthy and reveal your wisdom to me. Your words bring rejoicing to my heart and clear vision for me to see. Help me to treasure your words and your call, which are more precious than gold, more enduring and more true. Continue to transform me to live as your faithful disciple, as I seek to love more fully each day. Amen. All of us have had some experience with people who have a hearing loss. When we have to deal with our own loss, we realize others do not understand what happens when hearing wanes. So the Reflection this week is on information coming from my own experience. I was in my 50’s when my housemates in Gaylord, Michigan told me I did not hear well. I did not notice it, except that I asked to turn the TV up in the evenings. Therefore, to satisfy them, I made an appointment with a specialist in hearing disorders. The result of the test showed that I had loss that could not be repaired by surgery. My left ear had 75% loss and the right ear 60% loss. The cause was aging and heredity. You may have heard people say everyone talks as if they have mush in their mouths. There is a reason for that. The first thing lost is consonant sounds, especially the initial consonant. Someone may be talking about a bell in the new building, and I would have heard fell instead of bell. I would mistakenly think that someone fell in the new building. You catch on quickly though, and watch the mouths of speakers. The “b” sound and the “f” sound clear things up for me by the position of the lips of the speaker. If clattering dishes in a restaurant annoys you, know that people with hearing aids have that sound increased so that they wince with pain. DO: Speak clearly at a speed slightly slower than normal. DON’T: Mumble or exaggerate your words. DON’T: Cover your mouth or look away. DO: Speak at a normal volume or slightly louder. DON’T: Shout. This will distort lip patterns. Deafness causes a loss of pitch, not volume. DO: If there is more than one person speaking, take turns to talk. DON’T: Speak over each other- this is very difficult for a deaf person to follow. DO: If they do not understand the first time, repeat it, and if needed try rephrasing it. 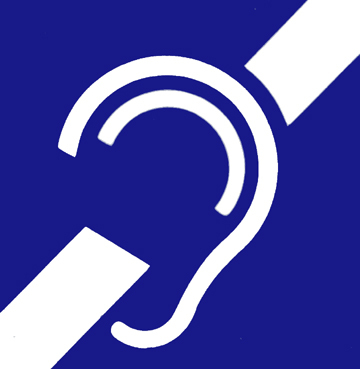 Remember; DON’T be afraid to check that the deaf person can understand you. Keep this motto in mind: Repeat, Rephrase, and Write it down. Having hearing aids is a lot like putting your fingers in your ears as you did as a child. Your voice echoes in your head and gives you a different sound than when you speak and hear your voice at the same time. That same sound in my head happens with every word I speak now. Because of that, I speak much softer when I am wearing hearing aids and when I take them out my voice raises considerably. That is why I take them out when I lector. Otherwise, I seem to whisper into the microphone. I was so glad to hear things after I received my hearing aids that the ticking of a clock was like music, and hearing bird’s song lifted my heart. I have to admit though, that removing my hearing aids makes for a lovely silent world; a world perfect for contemplation and meditating. So there are good things that happen even with handicaps! Love your ability to hear and use it well. I can no longer go to concerts or listen to music in the car. All those “noises”really rattle my head. BUT, when the Academy has an outdoor concert, I can enjoy that very much because the sounds are not bouncing back and forth against walls or car doors. Everyone has a handicap. Some are more noticeable than others. Love yours and put it to work for you and the Good, Wise, Gentle God who gave us each what we need. Repeat, Re-Phrase, and Write it down. A lovely bouquet of summer flowers was on display for all to see: daisies, roses, lilies all in a beautiful arrangement. A young woman brought the vase to the table where it now remained. When asked where the flowers came from, she said sweetly, “I brought them here.” leaving the questioner to make her own decision about what that meant. Actually, she had been asked to bring the flowers to the table because the true gardener, planter, and arranger needed to be somewhere else. Or an office worker does hours of research, and computation and makes a report to a co-worker, who takes the recognition for the hours put in by the assistant. Justice is not only upheld or violated when major issues are at stake, like hiring, pay, or housing. Praise accepted, when it is not mine, steals a bit of recognition from someone who may truly need it. That is injustice close to home. The Golden Rule, my friends, never loses its value in our relations with others. Remember to give credit where credit is due.